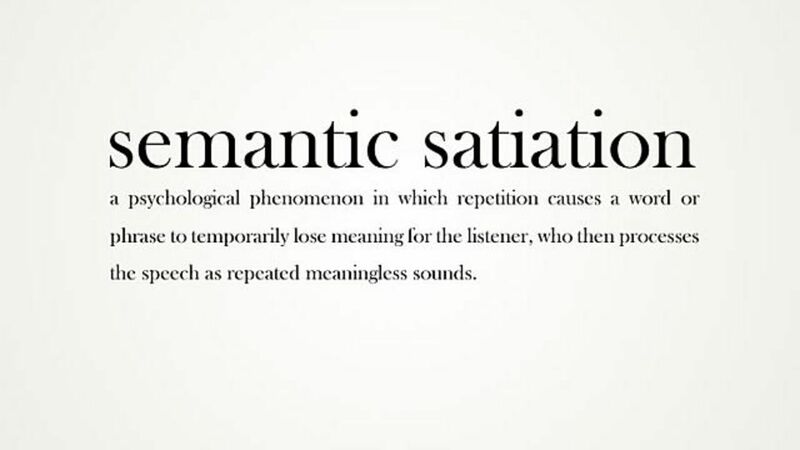 You may not have heard of the term ‘semantic satiation’, but I guarantee you know what it feels like! Have you ever looked at word for so long that it loses all meaning? This happened to me the other day with the word ‘talk’. What is that ‘l’ doing in there? Why do we pronounce it ‘tawk’? And what do those letters have to do with talking anyway? I got myself into quite a state for a few minutes, so I decided to look up the phenomenon and learn a little more about it. Semantic satiation is: ‘the uninterrupted repetition of a word that eventually leads to a sense that the word has lost its meaning.’ Usually, when you see or hear a word, neurons fire in your brain, connecting the word with its meaning. But when you repeat the word over and over again in quick succession, these rapidly firing neurons cause ‘peripheral sensorimotor activity‘, which leads to ‘reactive inhibition’. Reactive inhibition is essentially your brain getting bored with receiving the same repeated stimulus, and this interrupts the process through which you connect the word to its meaning, and that’s why the word breaks down into an apparently meaningless string of letters. Fortunately, semantic satiation is relatively short-lived, so the meaning will come back again after a while. Thank goodness – it’s not great for a proofreader to lose their ability to understand the meanings of words! But the phenomenon isn’t all bad. Word repetition has been used by stutterers to help reduce their speech anxiety. This phenomenon can actually lessen the negative emotions stutterers feel and help them in the long run. Amazing! When was the last time you experienced semantic satiation? What was the word?